1).Worlds Smallest Dog: 12.4 cm (4.9-inch) tall At 1.4 pounds and 4.9 inches tall, Ducky, a yappy short-coat Chihuahua from Charlton (Massachusetts, USA), holds the Guinness World Record for the world's smallest living dog (by height). 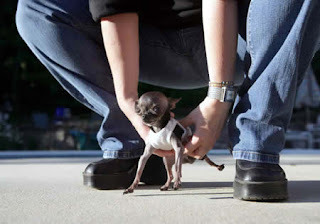 Ducky succeeds Danka Kordak of Slovakia, a Chihuahua who measured 5.4 inches tall. The smallest dog ever, according to Guinness, was a dwarf Yorkshire terrier who stood 2.8 inches tall. 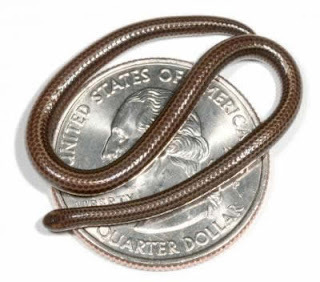 2).World's Smallest Snake: 10.1 cm (4-inch) long Leptotyphlops carlae is the world's smallest species of snake, with adults averaging just under four inches in length. Found on the Caribbean island of Barbados, the species --which is as thin as a spaghetti noodle and small enough to rest comfortably on a U.S. quarter-- was discovered by Blair Hedges. 3).Worlds Smallest Fish: 7.9 mm (0.3-inch) long On January 2006, the world's smallest fish was discovered on the Indonesian island of Sumatra: a member of the carp family of fish, the Paedocypris progenetica. It is the world's smallest vertebrate or backboned animal; only 7.9 mm (0.3 inches) long. The title, however, is contested by 6.2 mm (0.2 in) long male anglerfish Photocorynus spiniceps (not technically a fish but a sexual parasite) and the 7 mm (0.27 in) long male stout infantfish Schindleria brevipinguis. 4). Worlds Smallest Horse: 43.18 cm (17-inch) tall The little horse was born to Paul and Kay Goessling, who specialize in breeding miniature horses, but even for the breed Thumbelina is particularly small: she is thought to be a dwarf-version of the breed. 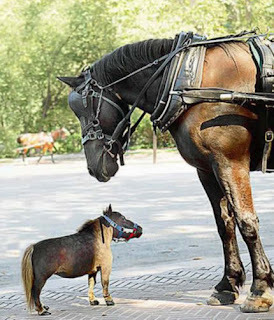 At just 60 lb and 17-inch tall, the five-year-old Thumbelina is the worlds smallest horse. 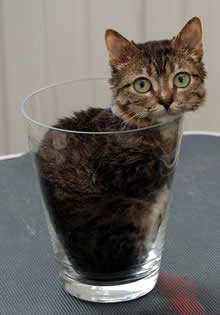 5).Worlds Smallest Cat: 15.5 cm (6.1-inch) high and 49 cm (19.2-inch) long Meet Mr. Peebles. He lives in central Illinois, is two years old, weighs about three pounds and is the world's smallest cat! The cat's small stature was verified by the Guinness Book of World Records on 2004. 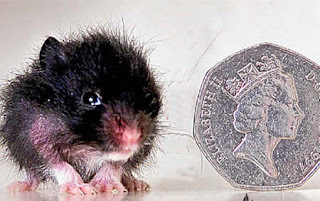 6).World's Smallest Hamster: 2.5 cm (0.9-inch) tall Only slightly bigger than a 50p piece, PeeWee is the smallest hamster in the world. Weighing less than an ounce, the golden hamster stopped growing when he was three weeks old - his five brothers and sisters went on to measure between 4in and 5in. 7).World's Smallest Chameleon: 1.2 cm (0.5-inch) long The Brookesia Minima is the world's smallest species of chameleon. This one is just half an inch. Found on the rainforest floor of Nosy Be Island off the north-west coast of Madagascar, females tend to be larger than males. 8).World's Smallest Lizard: 16 mm (0.6-inch) long So small it can curl up on a dime or stretch out on a quarter, a typical adult of the species, whose scientific name is Sphaerodactylus ariasae is only about 16 millimeters long, or about three quarters of an inch, from the tip of the snout to the base of the tail. It shares the title of "smallest" with another lizard species named Sphaerodactylus parthenopion, discovered in 1965 in the British Virgin Islands. 9).Worlds Smallest Cattle: 81 cm (31-inch) height The worlds smallest cattle is a rare breed of an Indian zebu called the Vechur cow. The average height of this breed of cattle is 31 to 35 inches (81 to 91 cm). 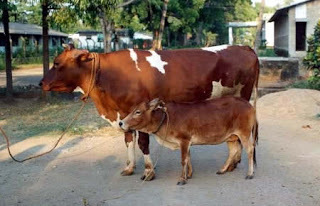 The photo above shows a 16 year old Vechur cattle as compared to a 6 year old HF cross-breed cow. 10).World's Smallest Seahorse: 16 mm (0.6-inch) long The creature, known as Hippocampus denise, is typically just 16 millimetres long - smaller than most fingernails. Some were found to be just 13 mm long. H.. denise lives in the tropical waters of the western Pacific Ocean, between 13 and 90 metres beneath the surface.